Over the past eight seasons, Benjamin Raich has won it all, a measure of his success is the fact he has even supplanted Herman Maier in the hearts of Austrian ski afficionados. Nicknamed 'the Blitz from Pitz' in reference to both his speed and his Alpine hometown near the Italian border, he has been near the summit of the global skiing hierarchy, except in the downhill, for a decade. In 2009, Raich came within a whisker of claiming the World Cup overall title, missing out by just two points to Norway's Aksel Lund Svindal when he dramatically straddled a gate during the final slalom race of the season. This was testament to his form a year ahead of Vancouver where it would be no surprise should he add to the two Olympic golds earned in the slalom and giant slalom in 2006 and two bronze in the combined and slalom in 2002. 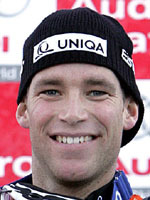 By the end of the 2008-2009 season, he had 34 World Cup victories to his name having made his debut back in January 1999 and claiming a first win, the prestigious night race at Schladming aged just 20. Languishing in 23rd position after the first run, the Austrian somehow managed to claw his way back with a fabulous second leg to win the race in sensational style. This early success was hardly out of the blue as 'Benni', whose hero was Luxemburg's Marc Girardelli, had won world junior titles in the giant, the slalom and the combined. His remarkable trajectory continued with a first crystal globe in the slalom in 2001 and a silver at the Saint-Anton world championships. In the year ahead of the Turin Games, Raich swept all before him, speeding gracefully to three crystal globes (slalom, giant and combined) and five medals at the world championships, including gold in the slalom and combined. The following year was equally fruitful with the Olympic golds in slalom and giant, making him the first man to attain that double since Alberto Tomba in 1988, being swiftly followed by his first and only World Cup overall crown. The wins made Raich a national hero and the fact he was also dating top Austrian women's skier Marlies Schild made them into a glamour couple amongst the fans and media. His performances since then at the world championships have been limited to a silver in the super combined in 2007 and another in the giant in 2009. But any reports of a decline are premature as he came second overall in the World Cup in 2007, 2008 and 2009. Raich will celebrate his 32nd birthday on the day of the Vancouver closing ceremony, where the 'Blitz from Pitz' will target Olympic medals for the third straight Games.